When planning is integrated with reporting – Blog DECIMAL | Budgeting and Planning, Costing and Financial Dashboards. NextWhy Are so Many Companies Still so Disjointed? Every organization has a system with many different modules – the general ledger, accounts payable, accounts receivable, payroll, for instance – that supports its operations and consolidates financial and operational data. However, this system is unable to provide more detailed, in-depth analyses or apply business rules. Completely separate and independent from this system, performance management solutions can automatically (or not) leverage operational and financial data, and generate more detailed and more precise financial information based on sound business rules. to identify and analyze trends – to distinguish the long-lasting from the merely passing – and base their decisions on reliable and quantified data. Organizations that put their trust in new technologies by acquiring enhanced and automated financial control can leverage their data; this gives them an advantage over their competitors who are less focused on their organization’s knowledge. Because massive amounts of data are generated so quickly, Finance departments are forced to use planning tools to anticipate events, collect and structure information in a database, and do their best to steer corporate performance. Saving time and being more efficient requires an environment with interconnected systems and automated processes. No more time-consuming planning and budgeting with Excel spreadsheets! These processes – that can last anywhere from several weeks to several months – take so long that, once finished, it’s practically time to start over again. Luckily, this activity belongs to another era. 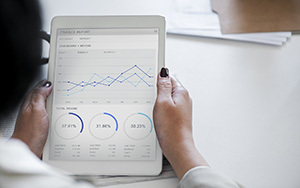 Now, Finance managers want to prepare regular budget monitoring reports, and get all other departments involved, so managers from these other departments can independently access information and compare actual and forecast data with just a few clicks. Not all solutions on the market today are created equal. That said, Strategic Corporate Performance Management (SCPM) and BI (Business Intelligence) solutions enable organizations to simplify and streamline processes and help them resolve data transparency, reliability, and consistency issues. These solutions, which are a real alternative to independently-managed systems, enable Finance managers to compare objectives with actual performance and to rapidly generate customized reports with different levels of detail. Among the currently-available solutions are those with a centralized multidimensional database that enables managers to easily tackle budgeting, forecasting and projections. They allow teams to: simulate scenarios; calculate costs; analyze performance gaps; use a powerful cost allocation mechanism capable of applying different business rules; calculate internal sales prices; and produce on-demand and self-service financial reports and dashboards. Another crucial aspect of performance management these solutions address is payroll and workforce planning. Basically, these specialized solutions enable you to track all your costs, in detail and on an ongoing basis.